The Flowers of Evil (惡の華 Aku no Hana) is a manga series written and illustrated by Shūzō Oshimi. It was serialized since September 9, 2009, in Kodansha’s Bessatsu Shōnen Magazine. 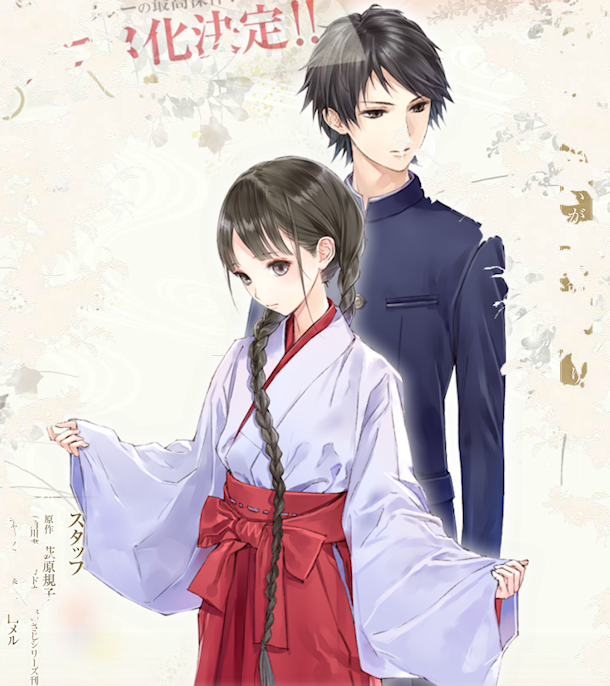 An anime adaptation of the series is being developed by Zexcs and aired on April 5, 2013 with a scheduled 13 episodes. Bookworm Kasuga Takao’s favorite book is Charles Baudelaire’s Les fleurs du mal (of which the series is named after). The story begins with Takao receiving an F on his math test. His day quickly turns from bad to worse when in a moment of weakness, he steals the gym clothes of his crush and classmate Saeki Nanako. Unfortunately for him, Nakamura Sawa, a sadistic girl with a chip on her shoulder, catches him red-handed and proceeds to blackmail him into a “contract.” Should he try to win over the girl of his dreams while confessing his misdeed or continue acting as a BFF to a sadist? Amnesia (アムネシア Amuneshia) is a romance, adventure, shojou visual novel (an interactive fiction game) series by Idea Factory. It debuted on August 2011 for PlayStation, with two follow-up sequels titled “Amnesia Later” released on March 2012 and “Amnesia Crowd” scheduled to be released in 2013. 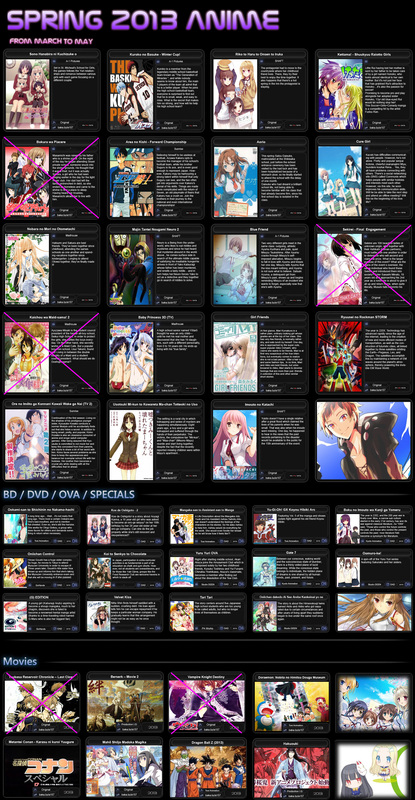 The anime series produced by Brain Base aired January 7, 2013 with a scheduled 13 episodes. A girl loses here memories and is aided in her quest to regain her memories with the help of her “boyfriend” Shin, a spirit named Orion who is only seen and heard by the protagonist and a childhood friend Toma. Hakkenden: Eight Dogs of the East (八犬伝 ―東方八犬異聞― Hakkenden: Tōhō Hakken Ibun) is a supernatural, historical manga series by Miyuki Abe. 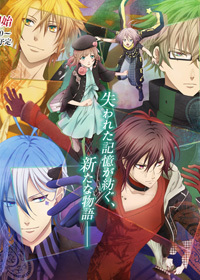 The anime adaptation produced by Studio Deen premiered on January 5, 2013. The series streams on Crunchyroll. Five years ago, the village of Ootsuka was hit with a plague that killed everyone…but two boys and a girl: Sino Inuzaka, Sosuke Inukawa and Hamaji. Now, the three children live in isolation in a church deep inside a dangerous forest, hidden from those trying to seek them out. The Imperial Church sets out to look for Murasame, the demon blade of life – the one that Shino, one of the survivors, wields. 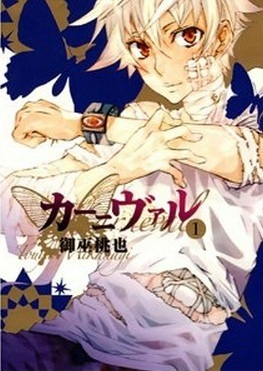 Karneval (カーニヴァル), romanized as K∀RNEVAL, is a fantasy manga series by Touya Mikanagi, originally serialized in early 2008. There are currently nine volumes released in Japan and is ongoing. The anime adaptation aired on April 3, 2013 and licensed for streaming by Funimation. Two unlikely tweeners, naive Nai and pickpocket Gareki, meet after they are set up and become wanted criminals by military security operatives. Just when they are at the end of their roads, they encounter Circus, a powerful defense organization for the country. 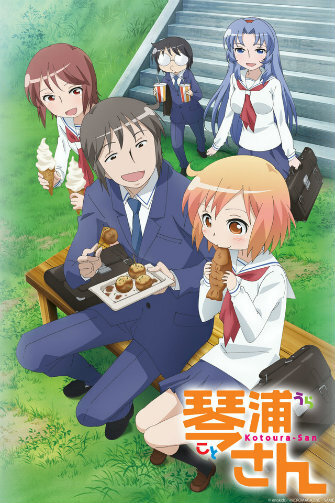 Kotoura-san (琴浦さん) is a romantic comedy manga series written by Enokizu. The series began serialization in Micro Magazine’s Manga Goccha magazine from October 14, 2010. A television anime adaptation by AIC Classic began airing on January 11, 2013 with a scheduled 12 episodes. This series is also simulcasted by Crunchyroll. Kotoura Haruka has the ability to read minds. Because of her extraordinary gift, she is ostracized. Soon, she transfers to a new high school and the not too bright Manabe Yoshihisa vows to be by her side! Togetherm they just the school’s ESP Research Club. 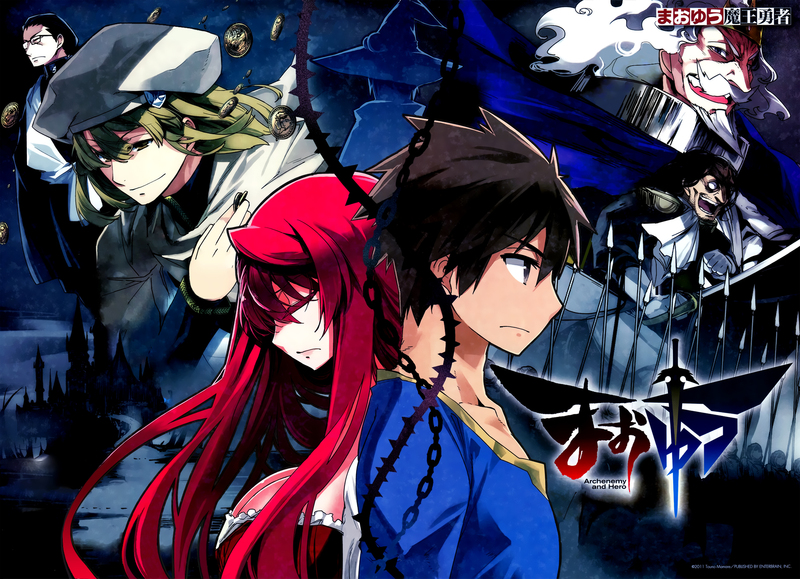 Maoyū Maō Yūsha (まおゆう魔王勇者 Demon King and Hero), aka Maoyu, or Archenemy and Hero is a light novel series by Mamare Touno. The first novel was published in 2010 and has released five volumes to date (and counting). There are five manga adaptations (all ongoing) and an anime adaptation that began airing on January 5, 2013 with a scheduled 12 episodes. The anime is also simulcast on Crunchyroll. 2. “Unknown Vision” by Akino Arai. In a world embroiled in war between Humans and Demons, a Hero invades the Demon King’s castle only to be met by a woman who proposes an alliance and peace. Together, they join forces to end the ongoing war between the two race. RDG Red Data Girl (RDG レッドデータガール RDG reddo dēta gāru) is a series of fantasy novels by Noriko Ogiwara. It was first published by Kadokawa Shoten in 2008, followed by five consecutive volumes. The anime adaptation is set to air in April 2013. Fifteen-year-old Suzuhara Izumiko is raised in Tamakura Shrine. She moves to Tokyo with her guardian and his son, her childhood friend Sagara Miyuki. While in Tokyo, she learns she is a yorishiro, a vessel of a shinto spirit, and Miyuki is a yamabushi, a warrior tasked with protecting her. Attack on Titan (進撃の巨人 Shingeki no Kyojin “Advancing giants”) is a dark fantasy manga series written and illustrated by Hajime Isayama since 2009 and is ongoing. 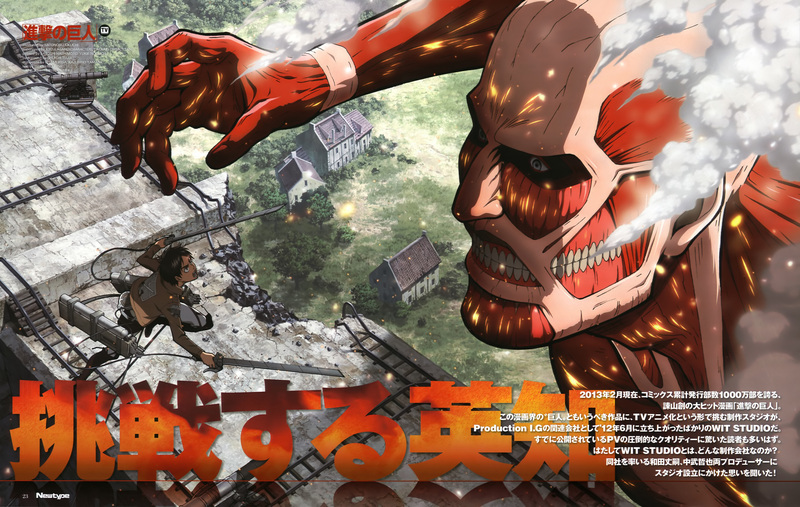 The anime adaptation series debuted on April 6, 2013 with a scheduled 25 episodes. Both Funimation and Crunchyroll are streaming the series. A consequent live-action film adaptation is also in production. 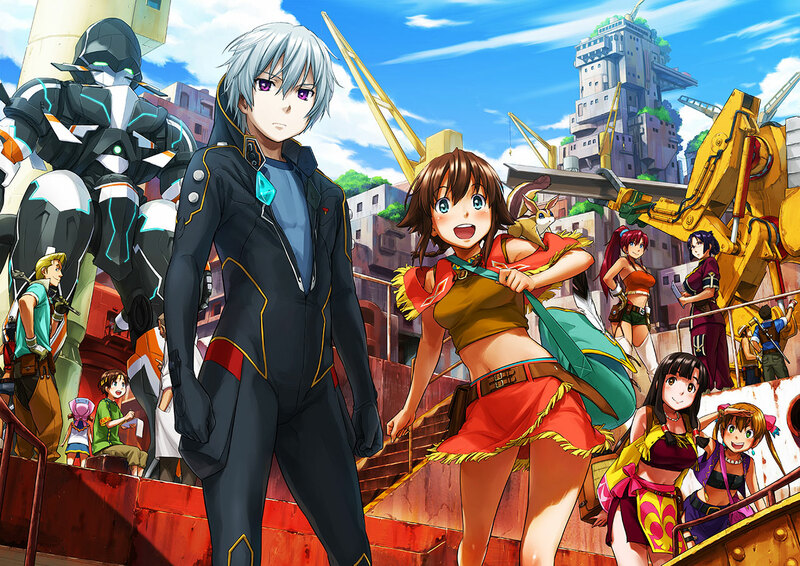 Gargantia on the Verdurous Planet (翠星のガルガンティア Suisei no Garugantia) is a sci-fi/mecha manga written by Mitogawa Wataru was serialized in January 2013 and is ongoing. The anime adaptation aired on April 7, 2013 with a scheduled 13 episodes is also streamed on Crunchyroll. Set in the distant future, mankind calls space home and forms the Galactic Alliance of Humankind, which protects their kind from a plant-like alien species called Hideauze. Protagonist 16-year-old Ledo is a lieutenant for the Alliance who pilots Chamber, an AI-automated, humanoid-shaped battle suit. After a failed attempt to destroy the enemy’s super weapon, the retreating Ledo is knocked into a wormhole and loses consciousness. Six months later, Ledo awakens from cryo-stasis to find himself on Gargantia, a massive ship floating on Earth: the birthplace of humans, a place the Alliance knows of only in stories and thought of as a myth. Valvrave the Liberator (革命機ヴァルヴレイヴ Kakumeiki Varuvureivu, lit. 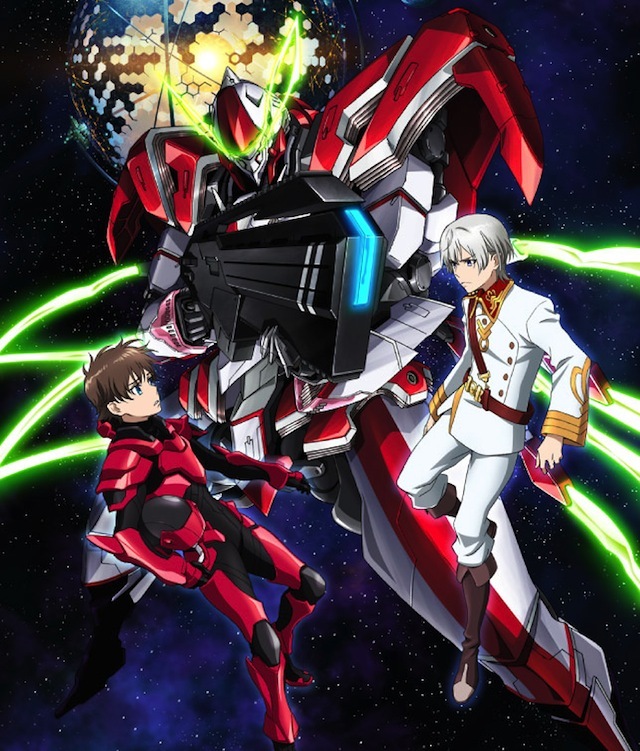 Revolution Machine Valvrave) is a Mecha anime series produced by Sunrise. It is written by Ichiro Okouchi, who wrote Code Geass and illustrated by Katsura Hoshino, the writer and artist of D.Gray-man. It premiered on April 12, 2013 and is simultaneously streamed on Crunchyroll. It is scheduled for 12 episodes. In the 71st year of true era (真暦 Shinreki), 70% of all human have migrated to space due to the development of space cities. Set between two superpowers called the Dorssia Military Pact Federation and the Atlantic Ring United States (ARUS), there is a small neutral nation called Jior that has prospered economically. Protagonist Haruto Tokishima, a high school student living in Jior who always tries to avoid conflict, is forced to engage in “war” when the girl whom he has a secret crush on Shoko is presumably killed. He boards the mysterious mecha called Valvrave during Dorssia’s attack and is forced to “renounce his humanity,” thereby allowing him to power the machine while giving him special regenerative abilities and the power to transfer his mind into another person’s body. The Unlimited Hyobu Kyosuke (絶対可憐チルドレン THE UNLIMITED 兵部京介) is a supernatural manga series by Takashi Shiina. This is spinoff of Zettai Karen Children of problematic girls with psychic powers and a young man with no such power (Anime adaptation of this was aired between 2008-2009 with a total of 51 episodes). 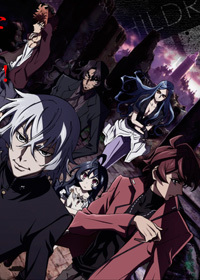 The Unlimited focuses on antagonist Kyosuke Hyobu began airing on January 7, 2013. 3. “BRIGHTEST LIGHT” by Yūichi Nakamura & Kishô Taniyama and other by Kōji Yusa & Junichi Suwabe. Kyousuke Hyoubu, an ESPer who was betrayed many years ago, is now one of the most powerful ESPers—and also a fugitive. However, behind that glare lies a kind heart. His main mission is to save ESPers who are mistreated by humans, even if that be by force. Through his methods, he has saved many ESPer lives and gained the loyalty of those he has saved. The name of his group: P.A.N.D.R.A. Fairy Tail is a manga created by Hiro Mashima serialized since Aug. 23. 2006 and is ongoing. Season 1 of the anime began airing on Oct. 12, 2009 and will end on September 27, 2010 with a total of 48 episodes. Even though it was initially meant for only one season, due to the popularity of the series, a second season was announced and began airing on October 2010. 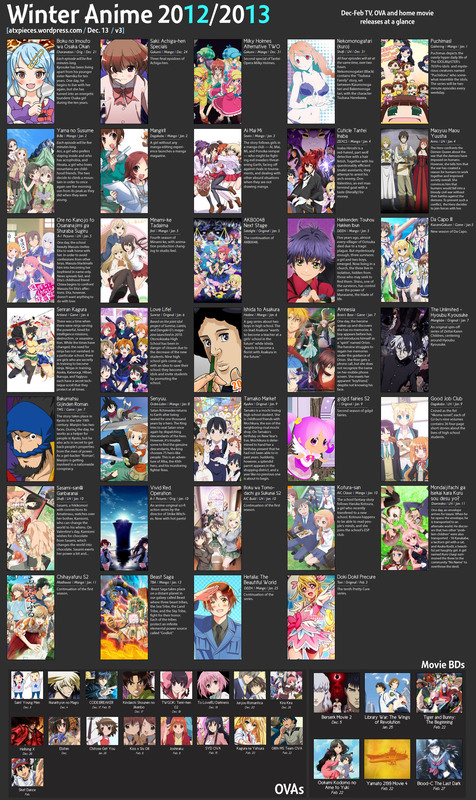 The anime is on its third season and going strong with 135 episodes and counting. This series is also being developed as a game for PS by Konami. They already have 3 OVAs “Welcome to Fairy Hills!” released April 15, 2011, “Fairy Academy – Yankee-kun and Yankee-chan” released June 17, 2011, and “Memory Days” released February 17, 2012. The movie, “Fairy Tail the Movie: The Phoenix Priestess” is set to be released August 18, 2012. It begins with Lucy Heartfilia meeting Natsu Dragnell and his best friend, Happy a flying cat, who is searching for a dragon, Igneel. Turns out, Igneel is Natsu’s foster father, the one who raised him and taught him the skills of a dragon slayer. Shortly after their meeting, Lucy is abducted by a person posing as Salamander of Fairy Tail, only to be sold as a slave. Natsu rescues her and reveals that he is the real Salamander. He then brings Lucy into the land of Fiore, and she is accepted as a Fairy Tale Guild member. Soon after, the three become teammates, together with two more Guild members, Gray Fullbuster and Erza Scarlet. Of the lot, Lucy brings forth a saner and calmer side to the rest of the team, albeit being exceptionally klutzy. 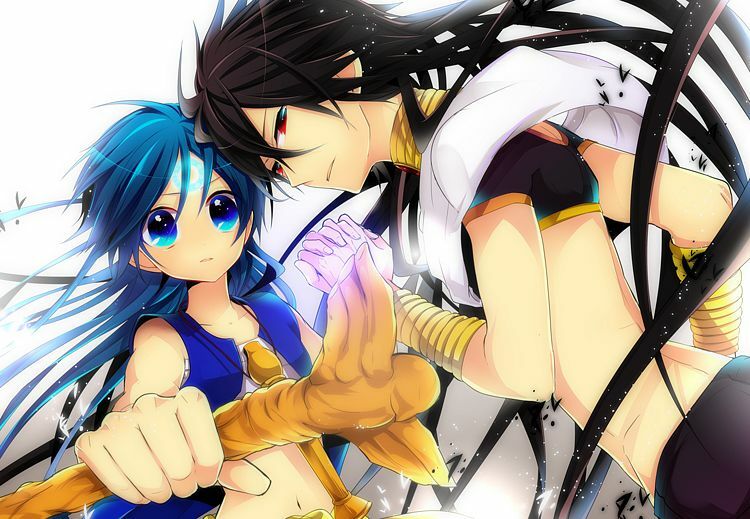 Magi (マギ) is an ongoing shonen, fantasy manga written and illustrated by Shinobu Ohtaka since 2009. 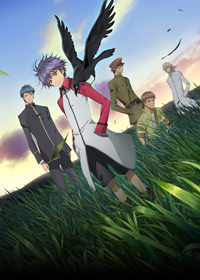 The anime airs Oct. 7, 2012. The series is a re-imagined tale from the Arabian Nights (One Thousand and One Nights). Aladdin has a magic flute that allows him to summon Ugo, the djinn. The comical duo meets Ali Baba, a young man with money on his mind. Together, they trek their way through the desert, encountering slave girl Morgianna and Sinbad the pirate. Naruto began as a manga series by Masashi Kishimoto, which was later adapted to an anime series that started airing in 2002 until present. The anime, much like the manga, is split into two parts: the time split in the manga is simply named Part I & II while the anime is named Naruto and Naruto Shippuden. The second part of the series takes place two and a half years after the first part ends. Since Jan. 2, 2009 Viz Media and Crunchyroll have been subtitling Naruto: Shippuden. The series is about a young and rash ninja from Konohagakure, the Leaf Village named Uzumaki Naruto. The story unfolds as Naruto searches for recognition and acknowledgment from his peers and elders as he aspires to become the Hokage – leader of the village. As a baby, the Nine-Tailed Demon Fox (kyuubi) was sealed in him to protect Konohagakure (the Leaf Village). However, the villagers, who were very much afraid of kyuubi, transferred that fear to the infant and eventually the child. Naruto grew up hated and mistreated by Konoha’s residents throughout most of his childhood. Naruto, together with Uchiha Sasuke and Haruno Sakura are placed in Team 7 lead by Hatake Kakashi. Even though the team seemed mismatched at first, the soon find that they complement each other. The noisy idiot, with the skilled genius and the quick-tempered thinker quickly become one. However, Sasuke has a one-track mind – he vows to avenge his family and clan by killing his beloved older brother. When the chance is presented upon him, he takes it and leaves the village forever. Naruto vows to bring Sasuke back to Sakura, but to do so, he have to become stronger. Unfortunately for Naruto, he is not the only one with a goal in mind. The Akatsuki is out to capture him, to drain him off the sealed Demon Fox. 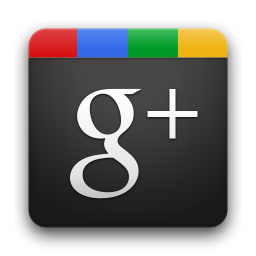 The thirteenth season began airing from Aug. 23, 2012 to present. The allies prepare for the Fourth Shinobi World War against Akatsuki led by masked man Tobi. Naruto and Killer Bee join the allied forces against a legion of walking deeds. Chihayafuru (ちはやふる) is a sport-romance manga series written and illustrated by Yuki Suetsugu since 2007 and is ongoing. The manga has won the Manga Taishō Award and the Kodansha Manga Award. Its popularity has boosted the profile of competitive karuta in Japan. 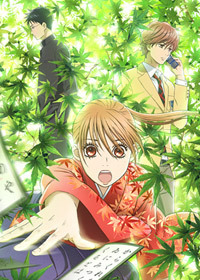 The first season of Chihayafuru aired in 2011 with a total of 25 episodes. The second season returned on January 12, 2013 with a scheduled 25 episodes. 2. “Akane Sky” (茜空 Akane Sora) by Seto. Ayase Chihaya is inspired by a quiet classmate, Watara Arata, to take up Hyakunin Isshu karuta competitively. However, as soon as her interest in the sport deepens, her team members are forced to separate. Now in high school, she continues the game in hopes to meet her childhood friends again. 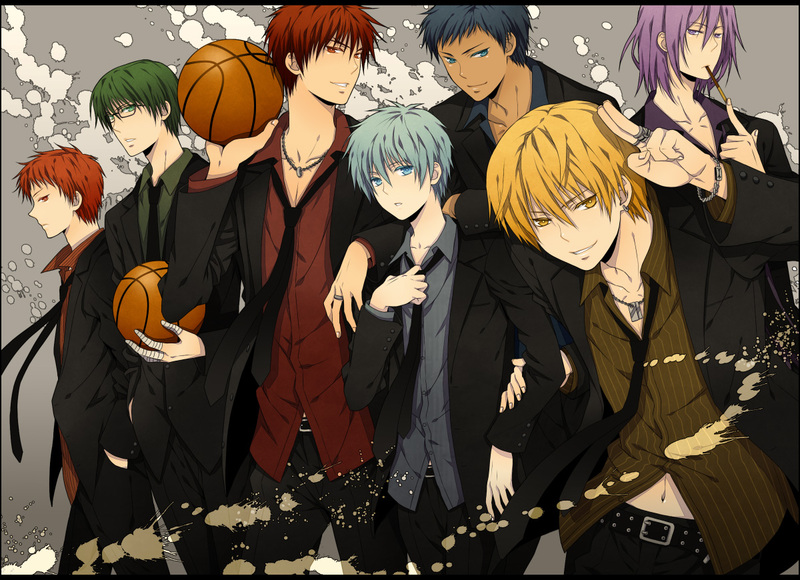 Kuroko’s Basketball (黒子のバスケ Kuroko no Basuke) is a sports manga written and illustrated by Tadatoshi Fujimaki published in December 2008. The first season of the anime adaptation aired April 7, 2012 with a total of 25 episodes. The second season of the anime is scheduled to return in October 2013. The legendary six-member basketball team from Teiko Middle School, called the “Generation of Miracles,” disbands and each member enrolls into different high schools. The stage is set for the best basketball competition ever, where the “weakest” team, Seirin High, tries to make it to the nationals with the aid of the “invisible” sixth player, Tetsuya Kuroko. It is so riveting watching the animation at work. The moves on these players are so real it is hard to believe you’re not watching a real basketball game in action. What’s more, you can’t help rooting for and liking the unassuming little fella. 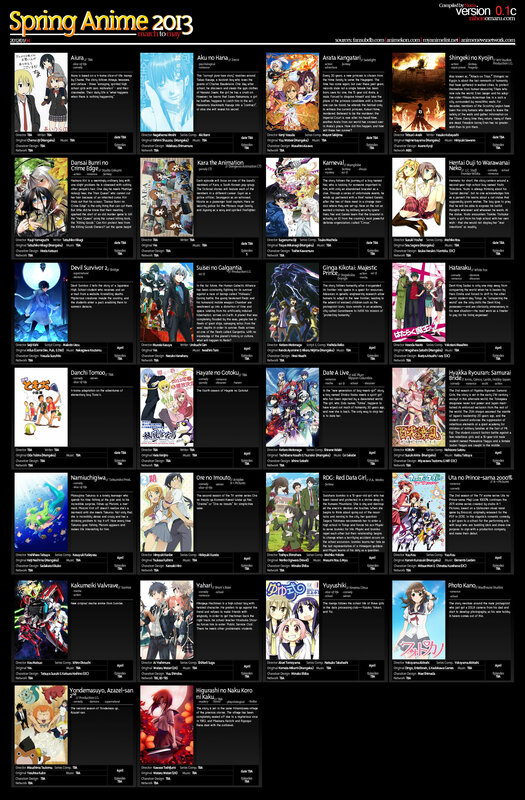 I SAW sekirei Season 3 on the spring chart is this confirmed?? Is Neuro, Tsubasa Chronicle and Vampire Knight Destiny confirmed? Because I can’t find any information about it!